CANADA – Vernon - Archaeologists near Vernon, B.C., have uncovered thousands of First Nations artifacts — some of which could be more than 6,000 years old — on a stretch of highway in Lake Country. "One of the cool things we found … was what we think are the remains of a fishing net," archaeologist Clinton Coates told CBC News. "We found these 30 flat, notched rocks spread out over about three metres. The net was left there with the rocks and over time the net would rot away." 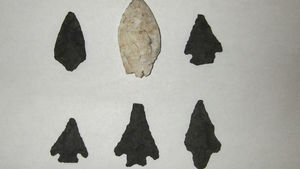 Thousands of arrowheads, spear points and hammer stones are among the finds. "The styles that we found are consistent with ones that are as recent as 200 years ago and there's one that may go back 5,000 or 6,000 years," Coates said. "We don’t know for sure until we've done some carbon dating." The recovery at the site is almost complete but the painstaking task of cataloguing all the artifacts has yet to begin. TURQUIE – Elaiussa Sebaste - Two ancient Roman shipwrecks, complete with their cargo, have been discovered by Italian archaeologists off the coast of Turkey near the the ancient Roman city of Elaiussa Sebaste. The ships, one dating from the Roman Imperial period and the other from about the sixth century AD, have been found with cargoes of amphorae and marble, say researchers from the Italian Archaeological Mission of Rome's University La Sapienza. Both ships were discovered near Elaiussa Sebaste, on the Aegean coast of Turkey near Mersin, according to a statement issued by the Italian embassy in Ankara. Officials say the discoveries - led by Italian archaeologist Eugenia Equini Schneider - confirm the important role Elaiussa Sebaste played within the main sea routes between Syria, Egypt, and the Anatolian peninsula from the days of Augustus until the early Byzantine period. Elaiussa, meaning olive, was founded in the 2nd century BC on a tiny island attached to the mainland by a narrow isthmus in the Mediterranean Sea. Schneider has been leading the excavations since 1995. France – Nice - Après une très longue d'attente, et une inauguration sans cesse repoussée, la crypte archéologique de Nice révèle enfin ses mystères au public. L'aventure a démarré en 2004. Les fouilles du tramway mettent à jour des vestiges à six mètres de profondeur. 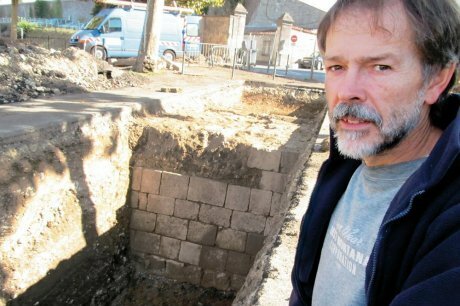 Cinq siècles d'histoire remarquablement préservés, du Moyen Âge à la fin de l'époque moderne, seront extirpés de terre... Situé sous la place Garibaldi, un espace de 2 000 m2 dévoile au travers d'anciennes fortifications une Nice insoupçonnée, autrefois puissante forteresse sous la tutelle des ducs de Savoie. En cheminant sur des passerelles d'acier, on découvre les vestiges d'une tour du XIVe siècle qui protégeait l'entrée de la ville, de bastions aux murs de 4,30 mètres d'épaisseur, de l'arche d'un pont, ou encore d'un aqueduc qui alimentait la ville en eau... Ce vaste ensemble architectural fut rasé par Louis XIV en 1706 et tomba dans l'oubli trois siècles durant. GRECE – Amphipolis - Αrchaeologists from the 28th Ephorate of Antiquities unearthed a tomb in the city of Amphipolis, near Serres, northern Greece, which they believe could belong to the wife and son of Alexander the Great, Roxane and Alexander IV. The circular precinct is three meters, or nearly 10 feet high and its perimeter is about 500 metes, or 1,640 feet surrounding the tomb located in an urban area close to the small city of Amphipolis. The head of the team, Katerina Peristeri noted that it is too soon to talk with certainty about the identities of the discovery. “Of course this precinct is one we have never seen before, neither in Vergina nor anywhere else in Greece. There is no doubt about this. However, any further associations with historic figures or presumptions cannot be yet made because of the severe lack of evidence and finances that will not allow to continue the excavations at least for the time being,” she added. The area has since 1965 been known as Kasta Tom, but these are the first excavations to take place there. The project began without any secured funds, which resulted in only parts of the impressive site coming to light. Analysts suggested that conclusions about the owners of the tomb cannot be drawn without first unearthing the tombs and discovering evidence about their identities. Nevertheless, local authorities and media rushed into claiming and believing that the tomb belongs to Alexander’s wife and son, who, according to legend, had been ostracized to Macedonia after Alexander’s death. There the 12-year-old Alexander the IV and his mother Roxane were murdered. 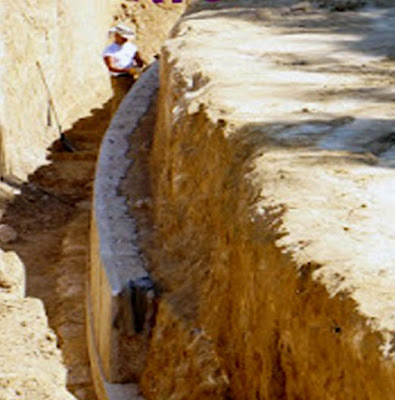 Tradition has it that the two victims were buried in Amphipolis but no evidence so far has proved this.